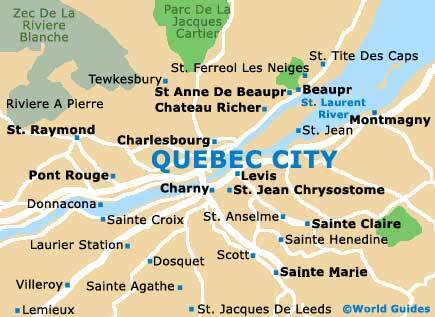 Quebec City is the heart of North America's French culture and stands in the province of Quebec (QC). With a particularly rich heritage, Quebec City is a place of extreme history and importance, with the Old Town region now part of the UNESCO World Heritage list, being surrounded by ancient fortifications. 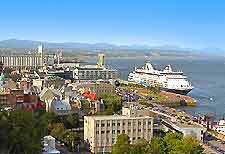 Quebec City is situated alongside the St. Lawrence River and spread over the Cape Diamond (Cap Diamant) cliffs. With winding, cobblestone streets, Quebec City is surrounded by countless appealing towns and villages, worthy of exploration. Visited each year by over four million tourists, Quebec City is predominantly French-speaking, although English is generally understood. Quebec City offers some of the country's best museums and is also home to a notable port, which is situated at the confluence of the St. Lawrence and St. Charles rivers. The city is divided into many significant districts and neighborhoods, including the Upper Town district - home to many of Quebec City's most famous buildings, including the legislative buildings of the National Assembly; the Lower Town District - located beneath the cliffs, with many popular tourist attractions on offer, such as the historic Place Royale; and the Old Port District - a redeveloped waterfront area based around Quebec City Harbor, in the Lower Town district. Hotels in the Quebec City area are abundant and often particularly European in both appearance and character. The most popular accommodation here is based around the center of Quebec City, with chain hotels close to shops, restaurants and sights. Spread throughout both the Upper Town and Lower Town districts, many of Quebec City's hotels are historic, particularly in the Old Town area, where a number of hotels offer views of the St. Lawrence River. 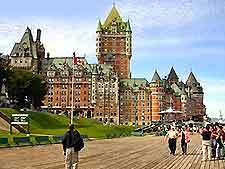 More information about Quebec City Hotels. Quebec City's tourism industry is extensive and tourists well catered for. The main tourist information centers in Quebec City are the Centre Infotouriste outlets along Rue Sainte Anne and the Avenue Wilfed Laurier, which offer advice and information on all aspects of tourism and city life, together with maps and leaflets about the main tourist attractions. Also, the Kiosk Frontenac is a popular tourist booth along the Dufferin Terrace and is a regular starting point for guided tours of central Quebec City. Quebec City's main tourist attractions include River Cruises - one of the best ways to fully appreciate Quebec City's skyline, with small whales often swimming close to the boats; Dufferin Terrace - a spacious boardwalk with stands next to the St. Lawrence River, in Old Quebec, with many popular must-see tourist sights nearby; Promenade des Gouverneurs - linked to the nearby Dufferin Terrace, offering superb river views; Artillery Park National Historic Site - notable restored barracks last used in the mid-20th century, with many seasonal events and demonstrations; Quebec Funicular Railway - a cliff-side railway, always popular with tourist and visitors to Quebec City; Grand Théâtre de Quebec - a modern building built in the 1960s, offering many concerts and performances throughout the year; and the Observatoire de la Capitale - a well-equipped observatory providing panoramic views of Quebec City and beyond. Popular parks and gardens in Quebec City include the Battlefields National Park, Domaine Cataraqui, the Cartier Brébeuf National Historic Site, Domaine de Maizerets and the Laurentides Wildlife Preserve, all of which offer walking trails, picnic spots and seating areas. Notable landmarks and monuments in Quebec City include the Fortifications of Quebec - historical walls which have long been an important part of Quebec City, dating back to the early 17th century; Parliament Buildings - a striking group of buildings in the St. Jean Baptiste area of Quebec City, an important political center; Place Royale - a historic collection of shops, cafés, restaurants and buildings, with origins in the early 17th century; Quebec Citadel - known for its important collection of military memorabilia, changing of the guards displays and superb river views; and the St. Anne de Beaupré Basilica - a charming and historic Roman Catholic chapel with appealing architecture dating back more than 350 years. 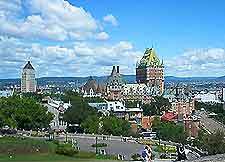 More information about Quebec City Tourist Attractions and Quebec City Landmarks and Monuments. Some of Quebec City's main museums and art galleries include Musée National des Beaux Arts du Québec - home to more than 20,000 art works, including a vast collection of paintings and sculptures; Musée de la Civilization - one of the most popular museums in Quebec City, with a host of information about the region's history and heritage; Musée du Fort - with a large selection of military artifacts and a detailed model of old Quebec City; Museum of French America - celebrating North America's French heritage and past, with many old local artifacts, exhibits and information about the 'Settling of French America'; Musée d'Art Inuit - featuring a large collection of Inuit and Eskimo works from all over Canada; the Naval Museum of Quebec - full of all things maritime, including displays and educational information about how sailing in Canada has evolved; and the Quebec Experience - specifically targeted at tourists visiting Quebec City, with multimedia shows and even laser displays. More information about Quebec City Museums and Art Galleries. Tourist attractions located nearby Quebec City include Sainte Anne Canyon - a superb natural tourist attraction, featuring a magnificent waterfall and lookout points, situated in Beaupré, close to Quebec City; Île d'Orléans - a large island containing six small villages, historic buildings, popular restaurants and suggested driving routes; Les Sept Chutes - a historic hydroelectric plant with parkland areas, which has become a popular excursion from the Quebec City area; and Montmorency Falls Park - a vast parkland on Quebec City's eastern suburbs, with many walking and cycling trails, and a superb waterfall. More information about Quebec City Attractions Nearby.